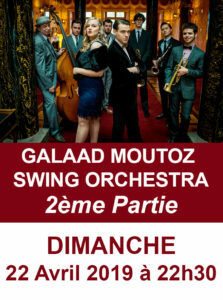 > GALAAD MOUTOZ SWING ORCHESTRA " 2nd Part "
The Galaad Moutoz Swing Orchestra is a French orchestra composed by 8 musicians and a couple of dancers, dedicated specially to Swing music. They follow the lineage of the American orchestras and dancings from Harlem in the 30's. Their unique sound connects in style punchy arrangements, an extraordinary diva and modern compositions. Convinced that a show is above all about sharing, their frantic jazz is adressed to dancers as well as to listeners, in a huge swing communion that is vibrating and sincere. You will not be deceived by the show of this gala evening.